From antiquity to our own time those interested in political economy have with almost no exceptions regarded the natural physical environment as a resource meant for human use. Focusing on the period 1600-1850, and paying particular attention to major figures including Adam Smith, T.R. Malthus, David Ricardo and J.S. 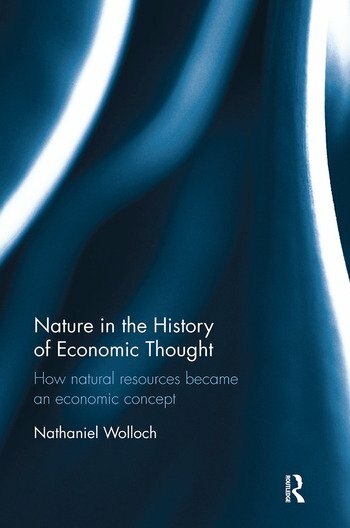 Mill, this book provides a detailed overview of the intellectual history of the economic consideration of nature from antiquity to modern times. It shows how even someone like Mill, who was clearly influenced by romantic notions regarding the spiritual need for contact with pristine nature, ultimately regarded it as an economic resource. Building on existing scholarship, this study demonstrates how the rise of modern sensitivity to nature, from the late eighteenth century in particular, was in fact a dialectical reaction to the growing distance of modern urban civilization from the natural environment. As such, the book offers an unprecedentedly detailed overview of the intellectual history of economic considerations of nature, whilst underlining how the history of this topic has been remarkably consistent. Nathaniel Wolloch is an independent scholar from Israel, specializing in European intellectual history. He is the author of Subjugated Animals: Animals and Anthropocentrism in Early Modern European Culture (2006), and History and Nature in the Enlightenment: Praise of the Mastery of Nature in Eighteenth-Century Historical Literature (2011). Author of "Shrinking the Earth: The Rise and Decline of American Abundance"